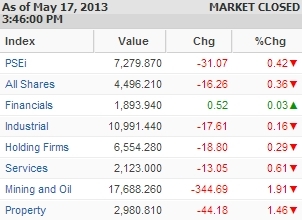 Manila—(PHStocks)—Philippine stocks declined further in Friday, 17 May, amid continued profit taking. The mainboard Philippine Stock Exchange (PSE) index slid by 0.42% or -31.07 to 7,279.87 as investors continued to cash in on gains achieved over the previous rally. 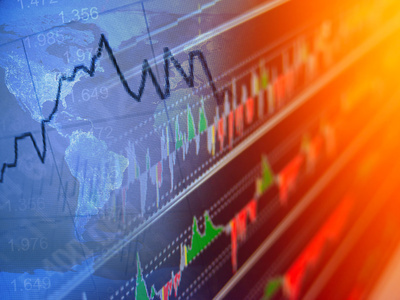 Despite the bloodshed, the Financials index managed to pull in a gain of 0.03%. The rest of the counters were down, led by the Mining and Oil index, which lost 1.91%. The Property sector, meanwhile, declined by 1.46%, and the Services sector shed 0.61%. Overall, the declines are minimal, overall. The wider All Shares index slid by just 0.36%. One key highlight during the day’s session was the IPO of the Asia United Bank Corp. (PSE: AUB). The stock was the top most active during the day, and was one of the top price gainers, gaining 9.47% from its opening price. Trading was heavy. Value turnover reached PhP13.42 billion on 1.9 billion shares traded. There were 65 gainers against 101 losers, while 44 stocks were flat. Apart from AUB, the other most active stocks are Metro Pacific Investments Corporation (MPIC, PSE: MPI), Alliance Global Group Inc. (PSE: AGI), SM Investments Corporation (SMIC, PSE: SM), Metropolitan Bank & Trust Company (Metrobank, PSE: MBT), Philippine Long Distance Telephone Co. (PLDT, PSE: TEL), International Container Terminal Services Inc. (PSE: ICT), SM Prime Holdings Inc. (PSE: SMPH), Universal Robina Corporation (PSE: URC), and Manila Electric Company (PSE: MER).